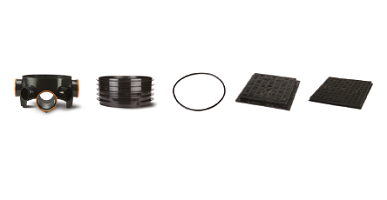 Our Polysewer Inspection Chambers are a range of 460mm diameter polypropylene inspection chambers, which provide an extension to our existing Polysewer product range. Both types of chambers are formed with a pre-benched base, side risers, seals and cover & frames. They provide a method of non-man-entry access to either non-adoptable or adoptable sewers for inspection and maintenance purpose. Polysewer 460mm Inspection Chambers for adoptable applications are designed in accordance with Sewers for Adoption (7th Edition), and are manufactured to comply with the test requirements of BS EN 13598. They are suitable for burial depths of up to 3m. 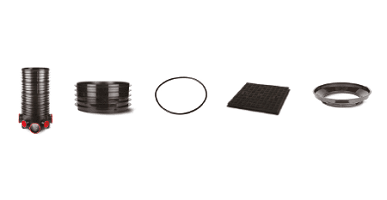 Polysewer Inspection Chambers are sold in component parts to be assembled on site. The base units are connected to Polysewer pipes, then side risers are used to build the chamber to the necessary height and can easily be cut to the correct level using a fine tooth saw. A seal ring is used to ensure a leak tight joint. Cover and frames are available in a range of load classifications. Polysewer 460mm Inspection Chambers for non-adoptable applications are designed in accordance with Building Regulations and are suitable for burial depths of up to 1.2m.